Cook the fresh green beans in water for about 5 minutes. Drain them and reserve some of the cooking water. In a large fry pan add the oil and garlic and sauté until the garlic starts to turn golden. Add the beans and toss together with the garlicky oil, mixing thoroughly. Add a ladle full of the cooking water and the lemon juice and blend together. Add the Parmesan cheese and toss a bit more. Cover and simmer until the cheese starts to melt, then remove from the heat and serve immediately. 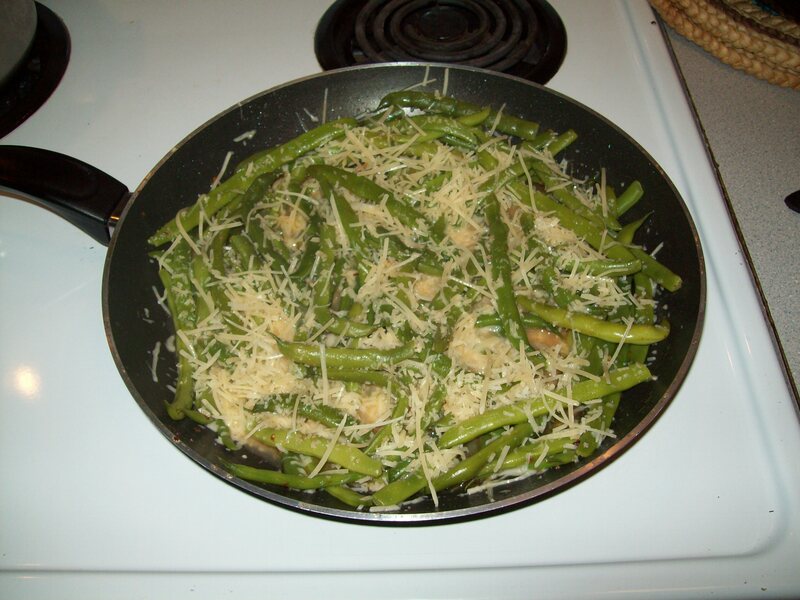 I’ve substituted the green beans with all kinds of other cooked vegetables and all the dishes taste yummy. I add a few shakes of my favorite garlic salt and some pepper because I like extra seasonings.